Here’s a reminder roundup of a few nice deals at Target that will only be valid thru Saturday, 11/17 or very soon after due to ending sales or expiring coupons and cartwheels. So if you’re headed to Target today or tomorrow grab whatever deals interest you while you still can! 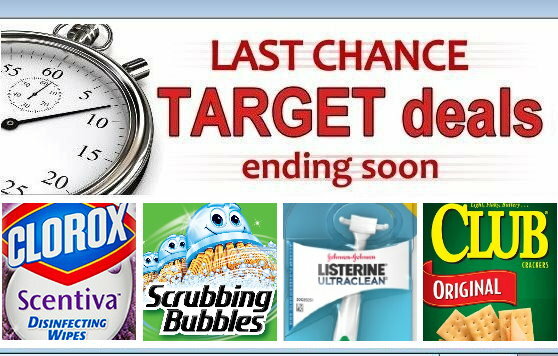 For other Target deals this week aside from the ones listed below, you can always check the Weekly Ad Page at the top of my site. This page always contains links to the complete current ad, best deals for the week & sale updates. –.75 OFF wyb 4 Del Monte Canned Fruit 14.5 oz+. = $6.71 for 2 or $3.35 each after stack & Target deal! –.50 off one Kellogg’s Pop-Tarts Frosted Sugar Cookie flavor.